Siklis Trek | Adam Tours & Travel Pvt. Ltd. The Annapurna Siklis trek is a picturesque trek that unfolds the natural beauty and traditional culture of Nepal due to the various geographical terrains, villages, rhododendron forest, high alpine meadows resting below the soaring peaks of Annapurna region this trek. This beautiful camping trek is a great introduction to the beauty of the Annapurna range and to the Buddhist Gurung culture. We can hear the beautiful chirping sound of the birds all along the trekking route. The trek provide s with awesome views of different Annapurna Himalayan Range along with Dhaulagiri and Mt. Manaslu. Siklis is one of the largest Gurung villages in Nepal and offers an opportunity to learn unique traditional culture and a truly captivating village experience where we get to see the real rural Nepal. This trek starts from Bijayapur Khola which is a short drive distance from Pokhara. From Bijayapur Khola we ascend through the rice Fields of Rakhi Gaon to Chautara. Silks Village allows you to study the prosperity of flora and fauna. Expedition through villages of the Gurungs, a people of Tibetan origins, who practiced an interesting shamanistic religion. The historically significant Annapurna Siklis trek passes through fascinating patterns terraced fields, remote charming villages, rhododendron forest and high alpine meadows. Climbing to the ridges of open pasture, we enjoy uninterrupted views of Annapurna II (7939m) and Annapurna IV (7525m). You will witness Mt. Dhaulagiri, Lamjung Himal, Fish Tail and other giants from marvelously scenic angle. The Siklis trail offers bird lovers a real pleasure as there are varieties of species of birds found abundance in this region. Rough and wild, this trek cuts through less traveled country south of Annapurna 2 and Lamjung Himal massif. 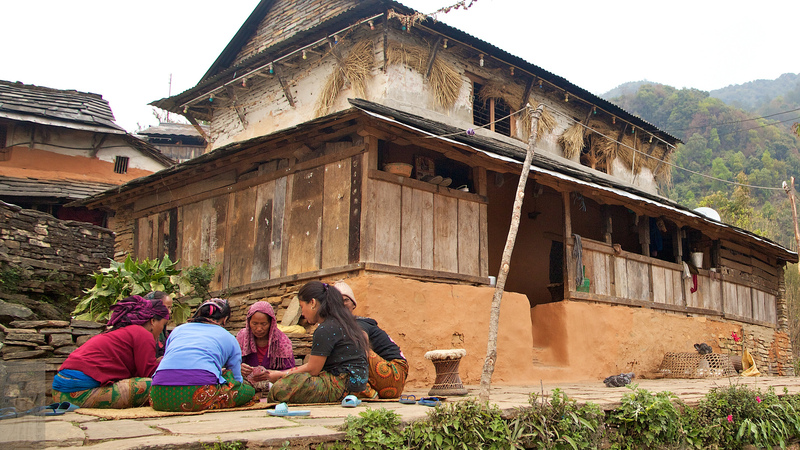 It boasts good mountain views and the local people are unaccustomed to trekkers. This invigorating Siklis trek is one of the wilderness treks in Annapurna region walking off the main trails through quiet forest, alive with bird song and a blaze of color in spring. The view from the ridges of the endless blue foothills as they roll southwards is unsurpassed anywhere in the Kingdom. Rare walk through shady forest of rhododendron- hung heavy with lichen and moss, wild flowers and orchids flowering on the branches can be the most remembering of this trek. The region is particularly good for bird watching because of its pristine forested surroundings where different species of birds thrive. Day 03: Flight or Drive to Pokhara, take a 25 minutes flight or 6-7 hour drive. Day 09: Pokhara to Kathmandu, take a 25 minutes flight or 6-7 hour drive. After having your breakfast, we will drive you to the Domestic Airport to take a 25 minutes flight to Pokhara. Or if you wish you can take a Tourist bus to Pokhara about 6-7 hour drive exploring & enjoying with scenic beauty all the way around. Blessed with pleasant weather, Pokhara is a tourist’s paradise full of natural as well as cultural heritage sites such as lakes, caves, Buddhist and Hindu temples and beautiful mountain views. In the evening, a boating trip on Phewa Lake will be followed where you can enjoy the spectacular views of Annapurna Himalaya Range reflected in all it’s glory in the calm green water of the lake. The trail starts near the army camp on the Prithivi highway, just east of the Vijaypur Khola. Cross the flat area of rice fields and the river trekking through different tribal villages before reaching the ridge of Kalikasthan. The campsite is situated above the village on grassy land with panoramic view of mountain, Begnas Tal and Pokhara city. A 6hrs trail proceeds through local villages of mixed ethnic groups and rice growing terraces up to Mardi Khola. Passing different water falls, the tracks moves down hill to the lush green hills that stretch for miles which stirs the imagination for good thoughts before climbing Lammchaur. Stay overnight at camp. The hike path climbs to Siklis (Largest Gurung Village) through dense rhododendron forests and cultivated fields. Most of the people here served in the Indian and British Army. You will be overwhelmed to experience the traditional culture of Gurungs. This is the best point to see the Himalayan panorama like Annapurna, Lamjung Himal etc. Camping along with their hospitality will be memorable. Today trek goes passing rhododendron and oak forests following a gently ascending path and then proceeding over flat land. While walking, you cross the highest pass of this trek (2100m). After hiking through the pass, you descend steeply to reach Ghale Gaon. It is a small village mainly inhabited by the Gurung and Magar communities. Enjoy the panoramic view of Fishtail with camping. The trek takes about 3 hours from Ghale Gaon to Pokhara. You descend through the forest passing a diverse range of tribal villages. Get familiar with the various ethnic groups like Bhramins, Chhetris, Thakali etc. In the evening you are free in Pokhara to feel the moderate climate and sceneries of this Magic land or Dream Land of Nepal. Also you can extend your journey here to explore the various interesting places like Mahendra Cave, David’s fall and the various lakes. Spend your night on the beautiful beaches lakeside. Day 9: Pokhara to Kathmandu, Take a 25 minutes flight or 6/7 hour Drive. We will take you to the International Airport for your flight back to home. Wish you a happy journey back to our home and hope to see you again. Above the Himalaya Trekking have made every effort to keep our price as competitive as possible, by still providing an excelling service to our customer. We pay our porters and guide the legal wages agreed with the porters union, our trekking staffs are some of the best paid in Nepal which allow us to attract only the best guides and porters and we have same amount of Insurance for guide and porter which is more than Government fixed amount. All our price are nett and there are no hidden cost everything is clear on cost includes and excludes this is the main reason all our customer are happy from our service. For up to date cost for the trip please contact us.